War photographer Paul Conroy does not believe he and Sunday Times war correspondent Marie Colvin “took completely foolish risks”, he has said while promoting new Hollywood film A Private War about her life. Conroy was with Colvin in Homs, Syria on 22 February 2012 when the makeshift media centre they were in was targeted in a rocket attack by regime forces. Colvin and French photographer Remi Ochlik were killed in the blast which also seriously injured Conroy. He managed to escape Homs after several day, documenting his experience in book and documentary Under The Wire. Speaking to Press Gazette this week ahead of the release of A Private War, Conroy said he felt “vindicated” by a US court judgment which last week found Syrian president Bashar Al-Assad’s regime liable for Colvin’s death, awarding her family $300 in damages. Conroy (pictured, right, with actor Jamie Dornan who plays him in A Private War) said: “Not only is that a victory for Marie’s sister and her family, the actual judgment itself is very focused on saying this was murder and silencing the press. “That’s why they awarded such high damages, they said, because the world has been denied Marie’s reporting. Colvin and Conroy took the risk to enter the besieged area of Baba Amr in Homs a second time despite already filing copy and pictures for the Sunday Times, deciding they could not “abandon” the civilians unable to escape. That night Colvin took part in live broadcasts for the BBC, Channel 4 News and CNN – a decision which ultimately enabled the Syrian regime to locate her and target the building in which she was based. Asked if the pair had taken unnecessary risks, former soldier Conroy explained the “mission creep” which means your decision making changes over time as “you become slowly acclimatised to the shelling and gunfire, the ever presence of danger”. “Our tolerance for danger built up to a point where we did what we did,” he said. Conroy said he does not regret any of the decisions they made – “at the time it seemed a natural thing” – although he regrets Colvin’s death. “Now I look at the film and documentary and, yes, I see how it looks that we were just going hell for leather but the reality is we were slowly getting inured to the danger. “I still don’t think we took completely foolish risks, even though a lot of people say: ‘Marie’s dead and look what happened to you’. Will he ever go back into the field as a photographer? Only for “the right reason,” Conroy said. “I wouldn’t go back just for vanity’s sake or because it’s expected of me. I don’t think I’ve got anything to prove to anyone. 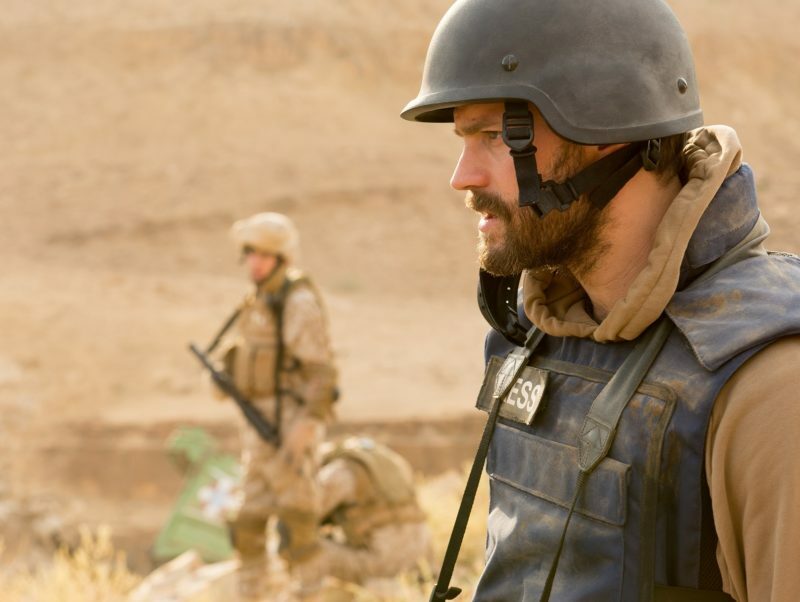 Conroy said it felt like an “outer-body experience” to watch A Private War being filmed because he found Jamie Dornan and Rosamund Pike’s performances as him and Colvin so believable. He gave Pike Colvin’s cigarette lighter and let Dornan – who he now counts as a good friend – try on the jacket he wore during the fatal attack in Baba Amr and use his cameras from his time in Libya. “I think those little things made a real physical connection to the story and I think that gave them a little edge,” Conroy said. He added: “It’s a big ask to get someone to play you and your best friend and actually have that person sit there and believe it, but I can sit there and believe it. But, Conroy added, he was often caught laughing during the filming of a serious scene because he would remember what he and Colvin had been joking about just before or after the event happened in real life. This sense of humour was also how he and Colvin got through traumatic times in real life. “That’s how we did it anyway, that’s what we do,” he said. He shows the lighter side of their relationship when asked what one thing he would ask Colvin if he got the chance. Conroy recalled an incident in Libya in which Colvin ate a fresh bread roll and pot of jam given to him by a doctor after months of only eating tins of tuna and cheese triangles. A Private War is in cinemas from 15 February. The film’s director, Matthew Heineman has said the movie is an homage to Colvin and journalism. The post Marie Colvin’s photographer Paul Conroy: ‘I still don’t think we took completely foolish risks’ appeared first on Press Gazette.